Our superior-quality blocks are precision made from hardwood with sanded smooth beveled edges. 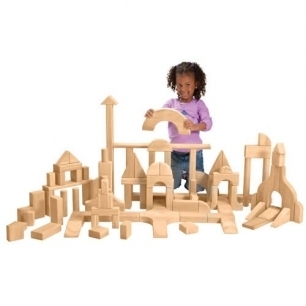 A total of 28 shapes are precisely dimensioned so the blocks are easy to stack. Each set comes with a lifetime guarantee. *Note: Kit components may change occasionally due to availability. We will substitute developmentally appropriate items for the purpose for which they were intended.